Habitech's modern approach to construction using smarter manufactured components is based on the material and structural efficiencies of the Structural Insulated Panels (SIPs) technologies we use in our walls and roofs. 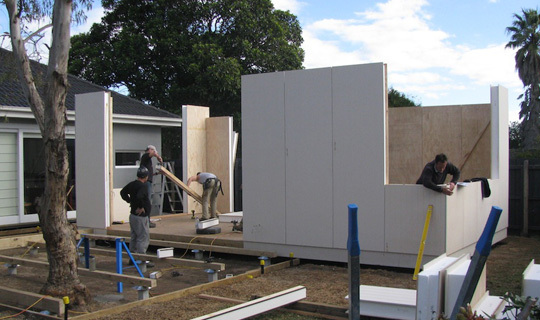 While SIPs are often made using oriented strand boards (OSBs) that sandwich a layer of rigid foam plastic insulation inside, at Habitech, we use the superior performance of plantation grown Australian plywood for the interior faces of our wall panels. The foam core is made of expanded polystyrene (EPS). SIPs are custom-made in factories and require little time and manual labour to manufacture. Buildings made using SIPs technology are frequently chosen for ‘zero-energy housing studies’. Their high R-values and low air leakage contribute to a greater level of thermal performance than traditional framed construction. Our sustainable building components do much more than simply deliver base building materials. They provide an integrated system to lock together and seal the outside fabric/shell of our buildings. 2.7m high ceilings as standard - 300mm higher than a common 2.4m standard ceiling. 2.4m window head heights as standard - 300mm higher than the common 2.1m standard, letting in more light. 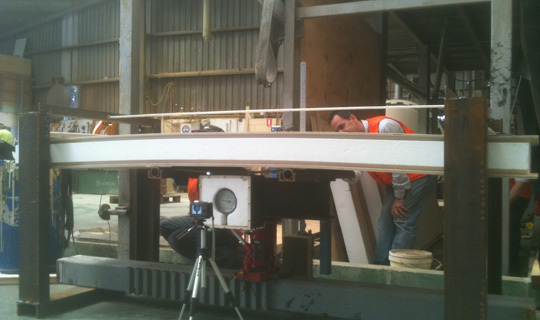 170mm thick walls instead of 90mm frames - our walls have a solid feel. Full height internal doors - our doors go from floor to ceiling, allowing for effective ventilation.